I think it takes more then just writing a book and having it published to make an author a Rockstar. To be a Rockstar the author's book must captivate the reader and leave them wanting long after the final page. Even more then a great book though, I think in this time of technological advances and widespread internet use for an author to be a true Rockstar they must have a solid internet presence and be willing and even eager to interact with fans of their work. Luckily, even with this tricky criteria, Heather fits perfectly! Heather's debut novel Glitch had me enticed from the first page and even now I am thinking about how I can get my hands on an early copy of the sequel, Override. Heather can always be found on Twitter as well as Goodreads promoting and interacting with fans. Needless to say Heather is a total Rockstar Debut Author and getting to do this interview with her may have made me fangirl squeal!! In case you have yet to read Glitch you can check out my review HERE and enter to win a copy for yourself below! 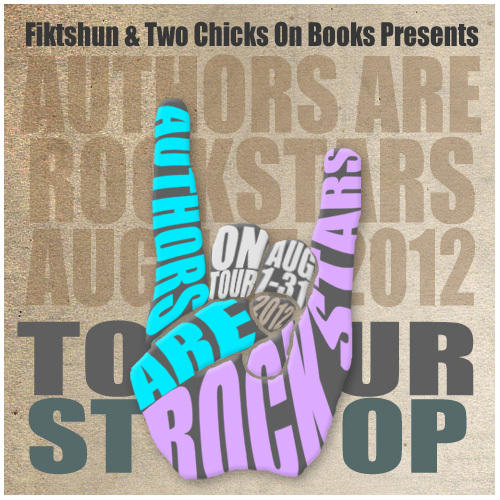 Q: Since this is the Authors are rockstars tour, who is your author rockstar? Libba Bray! Her books are fierce. I met her at a book signing once, and she was just as awesome in person as you’d expect after reading her books. I’ve wanted to be an author since fourth grade when my teacher told me it was something you could do as a profession! But then I stopped writing for about ten years and started dreaming about being a writer again in my early 20’s. Q: How long did it take you from first draft to publication of Glitch? Glitch was a book I had rattling around in my head for most of my spring semester of college in 2010, but I didn’t have time to write it until the summer. I sat down in July and banged out the first draft, edited for one insane week, then I was sending queries in August. This is not the advisable way to do things and I don’t think I could possibly write a book in the same crazy way now, but it worked well enough to get bites from agents. I went through SEVERAL rounds of editing with the fabulous Charlie Olsen who ended up signing me as a client in September of that year. After more edits, we went on submission in January, and sold in a few weeks. It was a whirlwind! Q: What gave you the idea for Glitch? My husband mentioned a Popular Science article about scientists researching the possibility of implanting something akin to memory chips for Alzheimer’s patients, and I was instantly creeped out and intrigued. I started wondering what other bits of technology we might start implanting in our bodies in the future, and how people in power might use it as a means of control. Mwahahaha, a dystopian society is born! 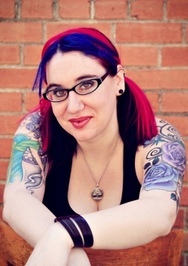 Q: Can you tell us anything about what is going to happen in the next novel, Override? I can’t say too much without giving away spoilers for book 1, but it continues exploring Zoe’s growing powers and her relationships to those closest to her. Rain, all the way. Nothing puts me in the mood to write like a rain storm, especially if there’s thunder. Inside, looking out the window. Coffee or Tea (Since I hear you write at coffee shops!)? Do you write to music or no music? With music. I listen to epic soundtracks to play along with the scenes happening inside my head. Oh Glitch sounds awesome and creepy! Love it. And what a fantastic interview. I loved getting to know a little bit about the inspiration for GLITCH and its road from idea to publication. Thank you so much for hosting this awesome rockstar author and for being a part of the tour! I'm so glad she met your rockstar criteria and that you loved her book GLITCH as much as you did! 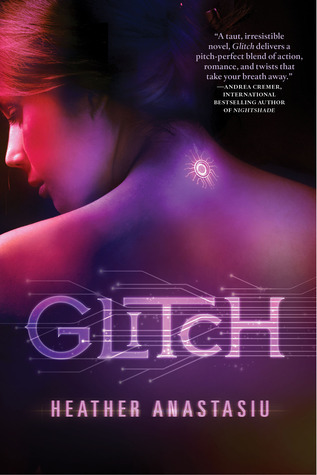 I haven't read Glitch yet, but it sounds so very interesting and is definitely on my TBR pile! Libba Bray is one of my faves too. Can't wait to read Glitch. It has one of the most beautiful covers I've ever seen! Thanks for the chance to win! Thanks for the awesome interview! I'm a big fan of rainy thunderstorms too as long as I'm inside during it. The idea for this book sounds just like how I usually get ideas to write that "next great" book. I've been wanting to read this one for awhile! It kind of has a Matrix-like feel. I really like the premise of Glitch. I've had it on my to read list since I first heard about it in January. Hi Heather! What is your favourite place to read/write? Any unpublished work - written before Glitch - that we should know about? Thanks so much for being a part of the tour! I can't wait to read Glitch! I love tattoos and curious how many she has. Thanks for a great stop. i can't wait to read Glitch. been waiting so long!! I'd like to know how she takes her coffee, since tea is an abomination! LOL! Thanks for the giveaway! I'm DEFINITELY excited to read Glitch!! :) Thanks for the great opportunity to win a copy! I've heard so many good thing about Glitch but haven't got around to reading it yet, but it's on my TBR list! I'm planning to read Glitch as soon as I finish TMI again :) I've heard its fantastic! I too am creeped out by the thought of technology being implanted in us - even if it is theoretically for a good cause! What a great idea for a story! I can't wait to read Glitch! Thanks for this giveaway - I would love to win a copy! Haha I love rain better than shine, too, Heather! Great interview. I enjoyed getting to know you and I can't wait to read your book! Thinking of having technology in my body really creeps me out! I wouldn't do anything like this, unless absolutely necessary, like after injury. Glitch has such a beautiful cover and the synopsis has intrigued me from the start. It was so cool to see where she got the idea for this book and it's really creepy to think about the future like that. I've had the book on my to-read list for some time now and I just find the summary interesting and I would love to give the book a try. I entered the giveaway and I hope it's international, if it's not please delete my entries. Martina K. in the form. I actually got the chance to read an ARC of the book. And I absolutely love it!!! It was really good and can't wait for the next book, Override. What was the hardest part for you to write in Glitch? Looks like another great book to add to my growing collection. I'm always looking for a new and good read to review for my blog! Congrats to Heather on her publication! Glitch was such a fantastic book! Wonderful interview and thanks for the giveaway! I absolutely adored Glitch, especially how Adrian has to get Zoe to fall in love with him again after her memory is wiped! Plus, the set up for the next book was sooo awesome! I can't wait! I love rain too! Woohoo! Haha. I totally love listening to soundtracks while writing! Rock on! I can't wait to read Glitch! I like how the idea of Glitch came from a conversation about implanting memory chips in Alzheimer’s patients. I love finding out how authors get there ideas. Glitch sounds really good, can't wait to read it! Nice interview. The book sounds interesting. So excited for this! I love books where the people are not supposed to have feelings but then they (glitch) do! Sounds like an awesome emotional story. Great intereview! An implant chip for Alzheimers sounds crazy!